Da Vinci Archival White Duo is a beautiful double sided lightweight paper; it has a smooth, natural white surface with a high colour gamut and acid free base. It is lightweight at only 225gsm making it perfect for professional bookwork, portfolios, and card making. Made from 100% Cotton this 315gsm "rag" paper is a fine art watercolour paper, with a special inkjet coating and a velvety smooth matte finish. It's natural white base is equally suited for colour or black and white reproductions and has brilliant capabilities for printing photographic and art images. 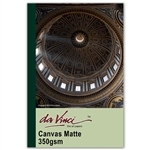 Da Vinci Canvas Matte is a stretchable cotton based canvas with a matte coating. The special ink receptive coating makes the single sided media water-resistant and protects the surface from cracking. As it's an acid free canvas, it is ideal for archival purposes allowing you to create beautiful canvas prints that can last for years to come. 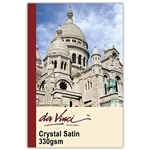 DaVinci Crystal Satin is a stunning natural white cotton paper. The surface has a subtle semi-gloss finish with a glorious crystal ‘shimmer’. This crystal layer effect enhances definition and tonal range and gives excellent shadow detail. 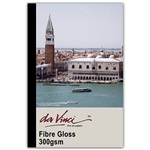 Da Vinci Fibre Gloss is a range of lignin-free, acid-free, museum grade archival, fibre based inkjet papers for fine art and photographic, colour and black & white printing, which puts the soul back into digital images.The semi-gloss surface is designed to simulate a traditional gloss unglazed finish. The Fibre Gloss Smooth 285gsm range has a smoother and slightly brighter surface than the 300gsm making it versatile for both bookwork and exhibition prints. Da Vinci Fibre Gloss is a range of lignin-free, acid-free, museum grade archival, fibre based inkjet papers for fine art and photographic, colour and black & white printing, which puts the soul back into digital images.The semi-gloss surface is designed to simulate a traditional gloss unglazed finish. The lighter weight of the 250gsm paper makes for easy handling and great for book work. Da Vinci Archival Soft Textured, has a natural white finish with a slightly structured, soft-textured surface reminiscent to a traditional fine art paper. It is an acid free, single side coated media with excellent colour gamut. This textured "rag" paper has a light warmth to its paper base giving it a natural feel in addition to the authentic textured look that make this a brilliant paper to reproduce fine art images. Da Vinci Ultrasmooth 280gsm has an alpha-cellulose acid-free fibre base, simliar to the Da Vinci Fibre Gloss, with a matte coating. It has a bright white paper base and a super smooth surface. It is an archival, single coated media with an excellent colour gamut. The silky smooth finish makes it ideal for both photo and digital fine art reproductions. This white matte paper has a soft texture that resemble ripples in the sand when the tide goes out! Acid and lignin free. Suitable for photographic and fineart inkjet printing.